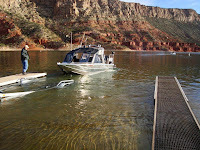 Based out of Lucerne Valley Marina Captain Monty has the ability to quickly relocate his jet boat and launch from any number of locations along the vast shores of Flaming Gorge creating the maximum access to all areas and canyons in the area for his guests. 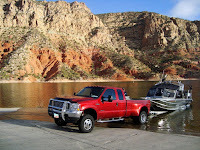 Guests select what type of jet boat experince they would like to have on the lake. 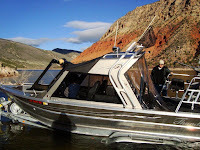 Trolling for giant lake trout, chasing the elusive Kokanee Salmon, working the intriguing canyons with their streams and brooks feeding into the gorge supplying fresh water and food to large German Browns and Rainbow Trout. 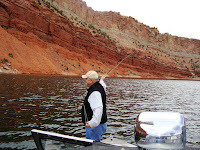 Even fishing the flats and beds for Bass or Fly Fishing from the bow or stern of the boat or you can easily leave the boat and get on shore for a really up close and personal relationship with the full natural beauty that Flaming Gorge has to offer. 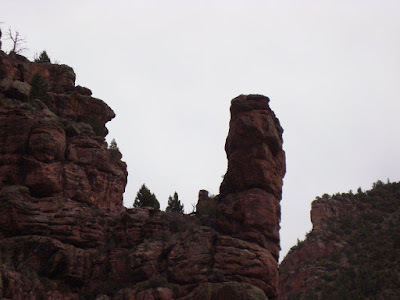 These locations are only accessible by Jet boat since the water is sometimes only 12" deep around the narrow canyon inlets. Experience the rapture and full grandure of the colors and canyons that is only accessible from a jet boat Captained by Monty. 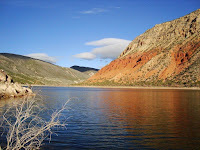 Even when you don't look up into the tops of the vista's and canyon walls the scenary is reflected in the pristine pure water of flaming gorge. Jet Boat With A Qualified Captain. Angler & The Fish Are All Yours! With Large Open Bays & Creeks. 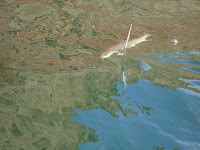 The Surface. & Access Full Rest Stop Services.